Over the next few years, major improvements are coming to Maple GO. Our design team is ensuring the new station meets your needs and those of the community. As of Monday, February 18, we will be temporarily relocating 75 parking spaces to the lot on Rodinea Road, just north of McNaughton Road, where 20 additional spaces have opened. Reserved parking spaces will not be affected. Some Carpool spaces will move one row west of their current location, but will not close. The spots at the station need to be empty to provide a safe work zone for the neighbouring condo development. The first phase of work will take approximately six weeks, but the spots will remain at Rodinea Road until fall 2019. We’ll follow up with more details on the next phases of work. Please leave yourself extra time in the morning, especially if you typically arrive after 7:30. Then follow the GO signage to find the entrance to the lot on the east side of Rodinea Road. 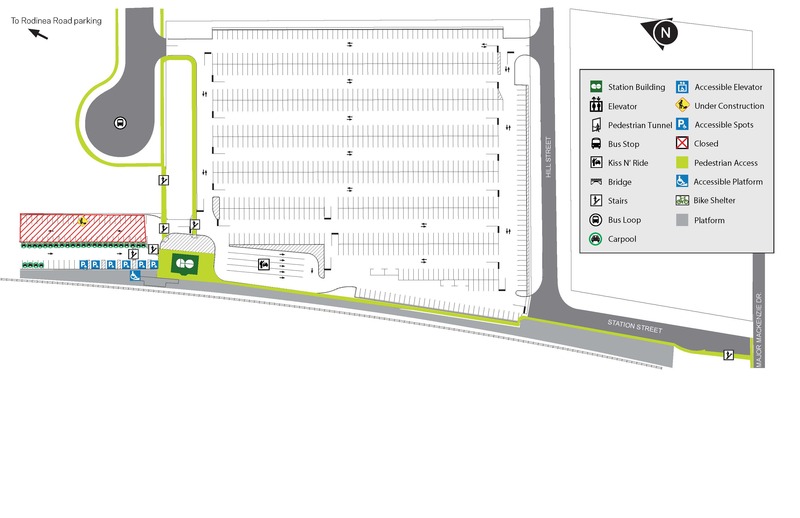 Maple GO Station features 38 Carpool spots dedicated to customers who drive and park at the station with at least one other passenger in the car. Visit Smart Commute North Toronto’s website to see which of your neighbours is travelling to the station at the same time as you. York Region Transit offers a Ride to GO program so you only pay a dollar to take transit to Maple. Learn about your travel options and about the Ride to GO program. We appreciate your patience during this temporary parking relocation. Two pedestrian tunnels have already been installed, which is the first phase of implementing two-way, all day service to your station. The tunnels are ready to connect you to a second platform and track in the future – both needed for increased service. We'll have a better sense of timelines once a contractor is on board. Separate from this project, we will be building a grade separation at McNaughton Road. This means we will be separating the tracks from the road so traffic will no longer have to wait for a train to pass, which will be a major traffic and safety improvement when we increase GO train service. We’re excited for the changes planned for Maple GO and we hope you are too! We’ll continue to update this page with renderings and status updates. It’s just one of the ways we’ll keep you in the know about construction at Maple GO.